Do Ina Raymundo, Alice Dixson, Sunshine Cruz ever feel old? Do Ina Raymundo, Alice Dixson, and Sunshine Cruz ever feel old? 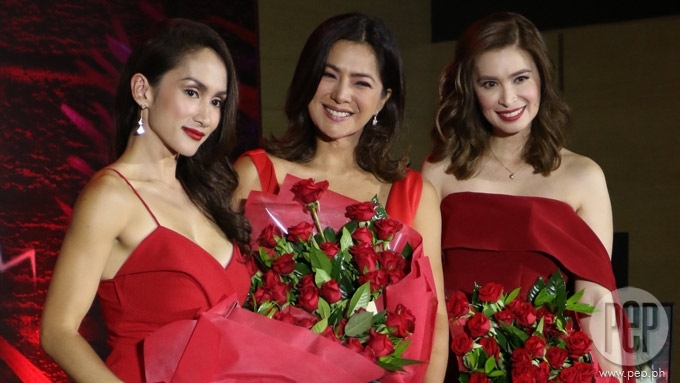 Ina Raymundo, Alice Dixson, and Sunshine Cruz headline this year's Century Tuna Superbods Ageless alongside Paulo Avelino, Gerald Anderson, and Matteo Guidicelli (not in photo). No matter how many times we’ve seen Ina Raymundo, Alice Dixson, and Sunshine Cruz on Instagram, we’re still in awe of their seemingly ageless beauty. Believe it or not, these showbiz veterans are already in their 40s, with Alice Dixson almost a year shy from turning 50. While the million-dollar question has always been about their secret to youthful beauty, the press decided to ask a different question during the Century Tuna Superbods Ageless launch last February 7, at EDSA Shangri-La Hotel. Are there times when they actually feel old? Alice was the first to answer. As a volleyball enthusiast, the soon-to-be 49-year-old actress quickly acknowledged that her body often aches after a game. She said, “There are some things my body can’t do that it can do before. But the former beauty queen believed age is all a matter of perception. She explained, “I really don’t think about [age] too much kasi parang, you are what your thoughts are, right? “So if you’re thinking, ‘Aw, I can’t do this, I can’t do that.’ Your body will follow and that’s just a negative way to do so. For Sunshine, she admitted that taping for a prime time series has been a challenge for her. The Wildflower actress said, “Kapag sunud-sunod yung taping—like right now, almost every day nagte-taping kami for Wildflower, 'tapos medyo out of town. “So medyo nabubugbog yung katawan. Sunshine continued, “Nilalabanan ko siya through exercising. Meanwhile, Ina was straightforward about her response. The mother of five told the press, “To be really honest, I don’t feel old. “Because going out to the gym, working out, and eating healthy makes you feel young. “Hindi po ako nagyayabang, promise! But she did point out, “I have arthritis! "Sometimes I think it’s because of age, but no. “I know some people who are 20 years old and they have knee problems also, right? GAME FOR ADVENTURE. Despite the little reminders of their age, Ina, Alice, and Sunshine still aspire to pursue different kinds of sports and fitness activities. "I can’t leave my kids!” she laughed. “I know, I’m so attached to my kids! “But someday,I want to try crossfit. For Alice, she wants to try kiteboarding and paragliding. She said, “I’ve always had a thing about flying. “I’ve tried wind surfing before, so [kiteboarding] is one thing I’d like to do. Ina, Alice, and Sunshine headlined this year’s Century Tuna Superbods Ageless campaign alongside Paulo Avelino, Gerald Anderson (not in photo), and Matteo Guidicelli (not in photo). To avoid wrinkles, Alice Dixson avoids stress!